Penned by the Regensburg pastor and naturalist Jacob Christian Schäffer (1718-1790), these words provide a succinct description of the paper making process in the early modern period. They teach us that select raw materials were first turned into a pulp by fermenting them, and then stamping them with wooden hammers operated by a mill or beating them with the metal blades of a Hollander beater. They also tell us that this pulp was then formed into sheets using a mould. These sheets were in turn transferred onto felt blankets in order to soak up the water that helped facilitate stamping and beating. After this they were hung up to dry in a well-ventilated area. Paper intended for printing or writing was then covered with a thin layer of sizing, which typically consisted of animal glue, so that it could better retain ink. Finally, it was rubbed with a flat, hard tool until it achieved a clean finish. What Schäffer’s text does not tell us that the paper that concerned him was in many ways atypical. It was not made from the macerated linen (i.e. flax) or hemp rags that had served as the material of choice among European paper makers since the thirteenth century. 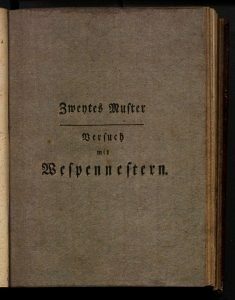 A complete description of Schäffer’s attempts to make paper from wasps’ nests and other ‘exotic’ materials appears in Versuche und Muster ohne alle Lumpen oder doch noch mit einem geringen Zusatze derselben Papier zu machen (1765). 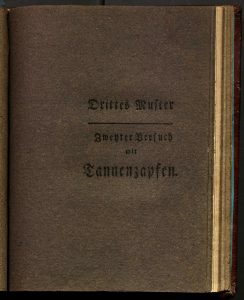 The first of six volumes published by Schäffer on what I call paper trials, it begins with an account of how for generations men of learning had been experimenting with material substitutes for making paper. Their goal, Schäffer argued, was to put an end to the cyclical relationship between waning supplies of linen rags and waxing costs of fine, white writing paper. As an avid participant in the Republic of Letters and as an author and publisher of natural history texts it is not surprising that he was sympathetic to their concerns. Nor that his interest in paper trials was piqued by his fellow entomologist, René-Antoine Ferchault de Réaumur, (1683-1757), who following his close study of American and European paper wasps suggested that it should be possible to make paper from a wide range of botanical specimens, including trees. 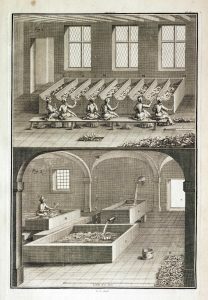 Schäffer’s first paper trial, conducted in 1764, examined the possibilities of making paper from the wool-like seeds of black poplar trees. He was disappointed by the initial results, noting how the corresponding sample lacked the rigidity (Steife) and density (Festigkeit) of paper made from linen rags. 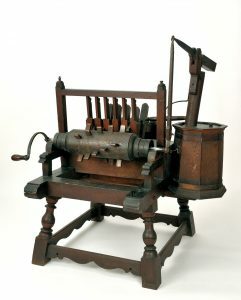 Nevertheless, he decided to go forward with more trials and had a miniature Stamper built to his specifications and set up in his own house so that he could supervise the paper making process directly. He also hired a couple of journeymen (Gesellen) to help him carry out the more than eighty paper trials on over fifty different kinds of materials that would occupy his attention over the next seven years. The precision with which he addressed variables like time, combined with his decision to include samples from each experiment alongside the text turned Schäffer’s books into veritable “how-to-manuals.” Within a year of their publication, men of learning across Europe were installing miniature Stampers in their homes and making paper from Schäffer’s recipes with the help of artisan assistants. Some, like Gerhard Anton Senger (1754-1822), even tried to convince commercial paper mills and government bodies that they should do away with paper made from linen rags, which often had to be imported from foreign suppliers. 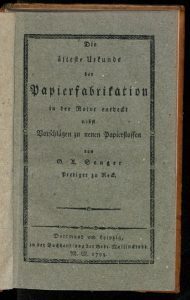 Instead one should learn to make use of locally available resources, such as the green algae (Conferva) that filled the lakes and streams of Senger’s native Prussia and provided the topic and the material support for his Die älteste Urkunde der Papierfabrikation. Although paper made from Conferva had an unsightly greenish hue, Schäffer noted in his recipe that if left out in the sun, it would eventually assume the pristine, white color that made paper from linen rags so economically and socially desirable. Gabriella Szalayis a Ph.D. Candidate in the Department of Art History and Archaeology at Columbia University in New York and in the Philosophische Fakultät at the Georg August University in Göttingen. 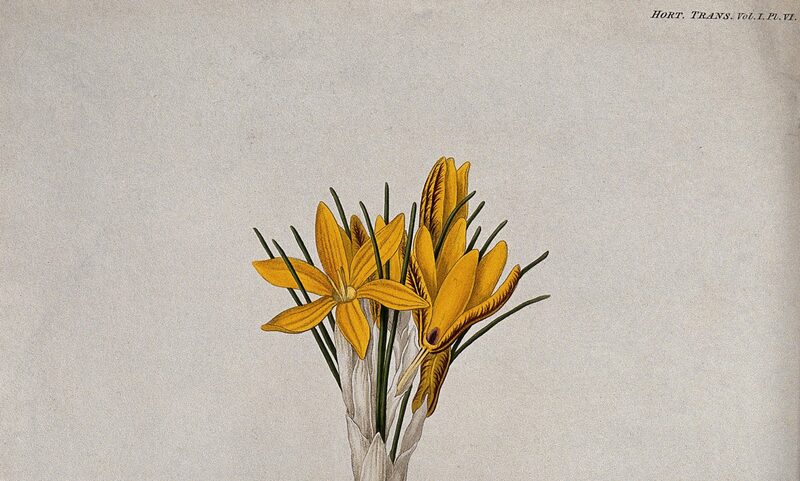 Since the fall of 2014 she has been Research Fellow at the DFG-Funded Graduiertenkolleg “Cultures of Expertise from the 12th to the 18th Century.” She will be finishing her dissertation “Materializing the Past: The History of Art and Natural History in Germany, 1750-1800” in the spring of 2017. This fall she will be part of the Working Group Working with Paper: Gendered Practices in the History of Knowledge at the Max Planck Institute for the History of Science in Berlin. 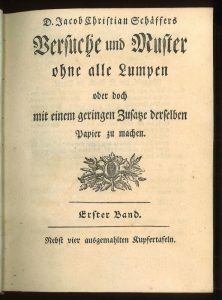 Jacob Christian Schäffer, Versuche und Muster ohne alle Lumpen oder doch mit einem geringen Zusatze derselben Papier zu machen (Regensburg, 1765), 33. Among the names singled out by Schäffer for their interest in finding material substitutes for paper were Albertus Seba (1665-1736), Jean-Étienne Guettard (1715-1786) and Johann Gottlieb Gleditsch (1714-1786). Réaumur first presented this idea to the Académie des sciences in Paris in 1719, more than one hundred years before paper produced from wood pulp began to be produced on a commercial scale in 1845. Jacob Christian Schäffer, Neue Versuche und Muster das Pflanzenreich zum Papiermachen und andern Sachen (Regensburg, 1767).